So you’re thinking of joining us for a stylish night out at The Winner’s Circle—but you’re not sure about virtual horse racing? On the night, we’ll present a specially-produced video, containing multiple horse races, all filmed at prestigious racecourses in the UK. We will watch several races, one race at a time. Each race features 8 different horses, and each race lasts between 3 and 5 minutes. Before we watch a race, the MC will invite you to place your bets on the horses in that race. For fun, you can look at their names in the race card—but there are no betting odds to worry about. Just pick your favourite to win! Head to the betting desk to place your bets. Each bet costs $2. The betting desk will give you a betting card showing the number of the horse you have bet on to win. Hold onto this betting card—it could be a winner! After a short period of time, our MC will announce that betting for that race is over. We’ll watch the race on the big screen—which includes an amusing guide to each horse and full commentary on the race—to see which horse wins. If your horse wins, hold onto your betting card! You can exchange all your winning cards for 50/50 tickets later. In fact, the only way to enter the 50/50 prize draw is by presenting a winning card—so keep betting for more of a chance to win big! At the end of the night, we’ll hold the 50/50 prize draw! The 50/50 jackpot will be made up of all the money collected from everyone’s winning bets all night. 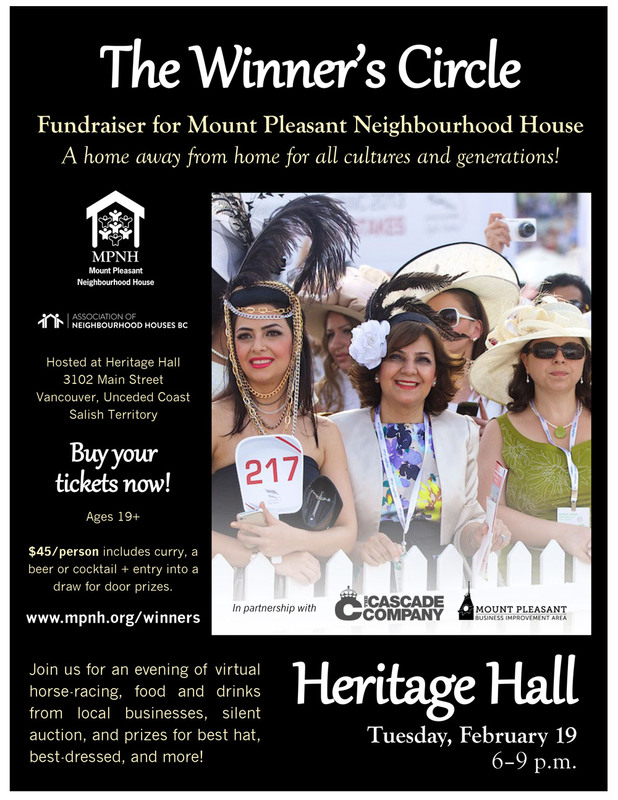 Half will go to Mount Pleasant Neighbourhood House, and half will go to the winning 50/50 ticket holders. Q) How do I know which horse to choose? A) In live horse racing, you can find out the horses’ history before the race—but virtual horse racing is different. All this information is secret, so there’s no way to know. Just pick a horse name or number you like—everyone else will be doing the same! Q) How many bets can I place in each race? Q) Do I win money if my horse wins? Here’s where it gets suspenseful! Instead of winning a prize when your horse wins, you’ll win a ticket for the 50/50 draw at the end of the night. The more winning betting cards you have, the more 50/50 tickets you get—and the more bets are placed overall, the bigger the jackpot.